1. Lowball Offers: Going far below market value when you make an offer damages your credibility as a buyer and can be insulting to the seller. The seller has a range in mind that they'll accept, and if you're not even approaching the low end of that range, they won't even consider the offer. 2. 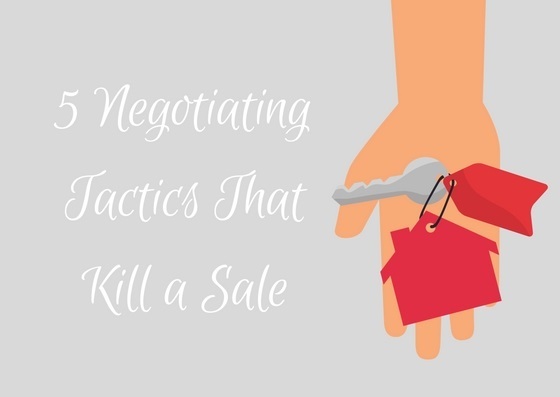 Incremental Negotiations: Don't continue to go back to the seller with small increases in your offer ($1,000 or less). The constant back-and-forth can grow tiresome and lead the seller to consider other opportunities. 3. "Take it or leave it": Try not to draw a line in the sand with your initial offer. The seller can get defensive and consider other offers if you immediately show that you're unwilling to budge. Even if it's true don't make a show of it. 4. Nitpicking After Inspection: Obviously if inspection reveals a major issue, it should be factored into the final sale price. But insisting on a lower price for every minor repair can put negotiations into a stalemate. 5. Asking for More, More, More..: Some buyers will request that seller throw in add-ons like furniture or appliances that weren't included in the listing. Try to avoid giving the seller a reason to build up resentment and think that you're being greedy.